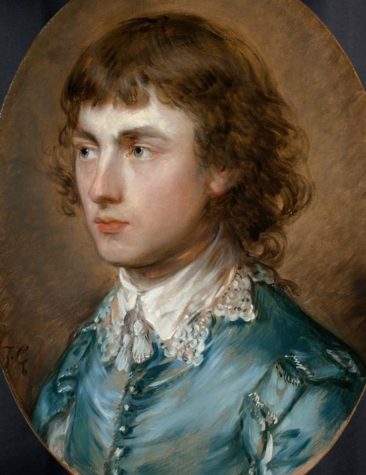 The surprise, when more than a century of yellowed varnish was removed from Thomas Gainsborough’s tender portrait of his young nephew, was not that the gorgeous satin jacket came up sparkling like a blue summer sky, but that the artist had included little flecks of blue in the handsome teenager’s hair and even eyebrows, and as a last touch added the highlights to his nose and forehead. The portrait is again as captivating as when the artist’s friend Philip Thicknesse first saw it in Bath in 1773, and called it “the finest head he ever painted.” The painting has been specially conserved for the Gainsborough’s Family Album exhibition, opening this week at the National Portrait Gallery in London (22 November – 3 February), after discussions between the gallery’s curators, and the experts at Waddesdon Manor where it has been one of the treasures since Alice de Rothschild paid £4,500 for it in 1910. It is being loaned from the house for the first time in a century.